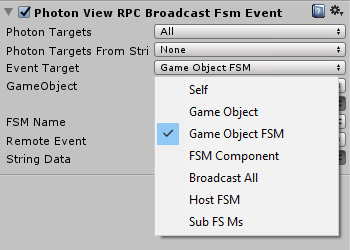 I am trying to target a specific scene game object's FSM as RPC target. I understand it can not reference an object directly. Tried adding Photon View and proxy, also instantiate the object similar as players, still getting the error. Profiler shows that RPC broadcast all events are creating CPU spikes and now researching a way to send them directly to the manager, which deals all the RPC. How those dropdown options are intended to be used (target as gameobj or FSM), any tips appreciated. I have used it long time ago in older Unity, but now seems to be not working in Unity 2017+, no errors or any reaction. Just tested my assets with Playmaker 1.8.8. Unfortunately all Float and Bool variables are reset in actions as missing variable fields. Is this to be normal with this release and here to stay? There are more than 1100 errors - missing set variables. Could you please check, I think you have keys for my assets, but I can give you another if needed for testing. It never sends Done or Failure events, but the Result string is filled correctly, can see with Debug. Downloading Vector 3 Lerp Advanced from Ecosystem, it shows a Parsing Error from internal script and the script is blank, please see attached screenshots. A game about emergency services, where you will choose your role to play as police officer, firefighter or medic. Open world environment with random missions to respond to. Single player and multiplayer gameplay is available that will have AI assistance that can be toggled on or off in online games. When a role is chosen, you will pick a vehicle that only you can drive. You must look after the vehicle's condition i.e. the gas, engine, tyres. You can also change cars and roles in the same game session. If a car is broken down or lost, you have the ability to call a mechanic AI or other player for a lift to the depot to pick a new vehicle. Successfully completing missions will grant you Respect Points for your town’s departments in the region, leading to the government funding new vehicles and gadgets. Anyone have an experience with «PhotonNetworkConnectManually» action? Or how do you make it so a user can choose a server/region? I had Best Region with «ConnectUsingSettings» action and this works, but I can't control where to join. With a help from Lane made a SphereCast2 action based of original SphereCast + Jean’s Raycast2. Get it on Snipt or Ecosystem or in the attachment. Hi, needed to get a pitch value for audio so I edit the SetAudioPitch action. prepared for AI cars and pedestrians. Functions made 100% with Playmaker. When importing in existing project make a Backup of your files! There will be New Project Settings needed to function. * SIMPLE assets need to be imported. Modular Traffic pack will hold prefab setups only, no recourses from Simple assets (models, textures etc.). If you have Modular Traffic you can upgrade to Car Setup for Playmaker with 30% discount! Use this setup to make your own racing, drifting, stunt or other games. you can upgrade to Car Setup for Playmaker with 30% discount! Playmaker Help / CharacterController collision after disable/enable property. I'm having a little trouble with Charecter Controller enable/disable property. - Capsule with CharController comp + simple move. - Dropping a cube with rigidbody component on character. Using CollisionEnter to detect collision with rigidbody gameObject. It works all good the first time, then after enable/disable Character controller wont detect any collisions. Any tip for this how to correctly do this? Or its a bug? I'm doing this when character goes to ragdoll and back, also for getting in car. Checked with CharacterCollisionHit event, but this one detects the ground and goes in loops..
An idea for getting around this, is to set the CharController position -600 on Y axis for that "off" time for example.. Thank you for reading, any help/tip please? Does PhotonView RPC event and RPC to Player actions have an option to send int and float variables? do you always convert numbers to send and recieve? Is it better to send Strings than numbers around the network? Posting this regarding a Skype group conversation. In Scene there are a "Sync Manager" for animations for Players. - and Finds Gameobject by Tag a player to set that info. there are dropdown menu with gameObject variable. For now I get an error, but fsm still running and stuck at that state. Floats and Ints works allright. Could I send this data somehow so a reciever gets that Players gameobject match? All Players have Photon View and gameObjects are renamed to Users custom name when joined.